For anyone in the web site acquisitions space, you probably already know about Flippa.com. They are currently the world’s largest marketplace for buying and selling web sits. What started off as a SitePoint forum a few years back, has taken on a life of it’s own and now a full blown out web site. With over $70,000 in daily web site transactions, the site keeps on growing and gaining more and more attention every day. With all of that said, the growth behind Flippa has been from their original launch off SitePoint, and mostly viral marketing. Flippa is a dominant force in a small niche market, which means it’s time for them to start advertising and pulling in even more site owners to join their online marketplace. 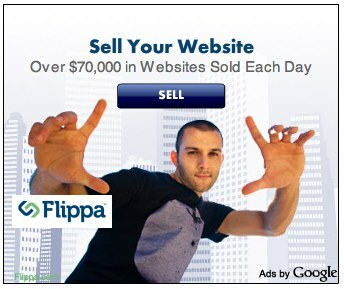 I am now starting to see a lot of Flippa advertising appear across several ad platforms. Here are just a few of the places where I’m starting to see Flippa advertising to me. One of the best ways to advertise is through Facebook Ads. Within minutes you can target the 700+ million users that are on Facebook by country, full demographics and interests. I am sure Flippa is targeting interest keywords such as “web site owners”, “designers”, “affiliate marketers” to get their ads seen. While I have seen the banner below quite a few times, I would recommend that they change up their ad copy and banners, as it isn’t that attractive or makes me want to click. If you want to get exposure across millions of web sites which a specific target in mind, Google Adsense is the way to go. I’m already seeing a variation of advertisements from Flippa through their Adwords/Adsense campaigns for bringing in new site owners to their marketplace. I like the 300×250 banner below, and how it states “Over $70,000 in Websites Sold Each Day“… however the 728×90 banner is a bit plain for my taste. I keep seeing these same two banners, so they are probably still testing the waters on conversions and results. Lastly, let’s take a look at what happens when you search “buy web sites” on Google. 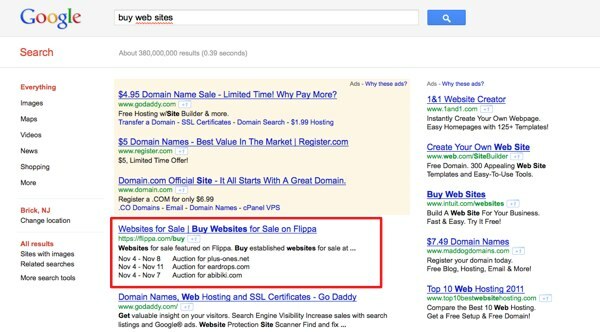 I’m glad to see Flippa isn’t advertising for the search term, since they are already ranked #1 in the organic results. Flippa already has a very powerful web site, for when it comes to ranking in the search engines. Since they are place so high in the organic results, it makes sense for them to keep running their social and banner ad campaigns and not focus on search for the moment. Just as important it is to realize the success that Flippa has had with their own web site, you can take these same principles and flip your web site for large sums of cash. Many web sites are selling for 10-20 times their monthly earnings, while some web site owners are seeing as much as 100 times earnings! To learn more about buying and selling web sites through Flippa, be sure to check out my book “Flip This Web Site“.